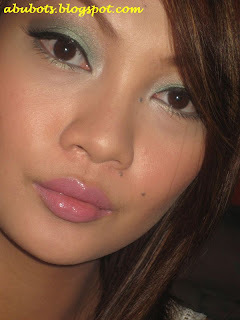 okay, since i am wearing almost the same shades of eyeshadows lately, i decided to give it a little more "omph." so what's this "omph" i'm talking about? yep...i decided to wear falsies today. i am not really into falsies since my eyes tend to look sleepy whenever i wear them, most especially the full sized ones. good thing, i've found these "XLH" falsies from The Face Shop. I first saw them on Phoebe and it really looked natural. I then bought some, not for personal use, but for my clients. hehehhee..and when i saw how natural and fab their lashes became after the falsies, that's the time i decided to hoard them from the store. it's always OOS, good thing i got to purchase 3...and will buy more next time. 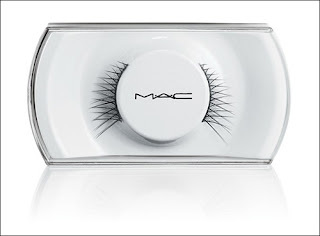 The XLH lashes from The Face Shop kinda looks like the MAC HK lashes (IMHO). i love, love the lashes. i even had to tell my officemates that i am wearing falsies today. they really didn't notice at all. they had to take a good look at my eyes to believe. i look tan on the pictures...MUFE 120 shade is dark on me. Good thing i have 117 too! yey. anyways, a review on the MUFE HD foundation is coming up next! seen this in person and sooooo freakin fabulous!!! :) psst.. ganda mo, ms.! lol! i can so relate with you izumi..i can hardly see with full lashes and aside from that, i really look sleepy!